It was opened on 9 April 1964 and is the first cable-stayed bridge in the United Kingdom. Before its opening in 1964 the only crossings of the river Usk in central Newport were the Newport Bridge carrying the main A48 road and Newport Transporter Bridge. Many grand names were proposed for the bridge but it was eventually named after the relatively small George Street on the western bank of the River Usk. The new bridge was built to ease serious traffic congestion in the Borough of Newport caused by the inadequate capacity of the existing bridge. Originally the bridge was planned to be six lanes wide, but with the M4 motorway Usk bridge already planned further upstream it was reduced to four lanes. Width four-lane carriageway, two cycle/footpaths (total 84 feet / 25½ metres). Height 171 feet (52 metres).Longest span 500 feet (152 metres). Constructed by Mott, Hay & Anderson / Construction began 1962. Historic accounts frequently refer to the bridge at Newport being in need of repair or rebuilding. However timber constructions spanned the Usk at Newport and were in constant use until the end of the 18th century. A public meeting was held on the 18th September 1789, where it was agreed to seek the authority of Parliament to use the county rate to erect a new stone-built bridge at Newport. In 1791, John Nash, probably the best-known architect of his generation, submitted plans and a model to the Monmouthshire justices which gave ‘great credit to his geometric talents’ and proposed the construction of an arch bridge that would have crossed the river in one span. By the end of the 1700s it became obvious that a more substantial and reliable bridge was needed at Newport and designs for a stone bridge were invited by a newly-set-up bridge committee. The winning entry was presented by the architect John Nash, who proposed a bridge with a single span of 285 feet (87m). This would have doubled the span of the existing world-record holder (Pontypridd, 141 feet - 43m). Detailed plans were drawn up and a scale model made. Work commenced... and then stopped. It is not known why this bridge was not built. If it had been completed it would have been an amazing sight, a world landmark... and probably totally useless for any form of transport other than pedestrians due to the height of the centre and the steepness of the ascent and descent! The first stone bridge on the site was a bridge of five arches, erected in the year 1800 by David Edwards (son of William Edwards). It was widened and improved in 1866. The original foundation stone bearing the inscription "This bridge was erected at the expense of the County by David Edwards and his two sons William and Thomas. Completed AD MDCCC." is now set into the stonework of Caerleon Bridge. By 1920 even the widened bridge had become inadequate, so work began to replace it entirely with a new structure. To best achieve this a temporary wooden bridge was erected alongside it and all power and gas lines were re-routed onto it. Even the town's tram lines and their accompanying overhead power system were moved over. 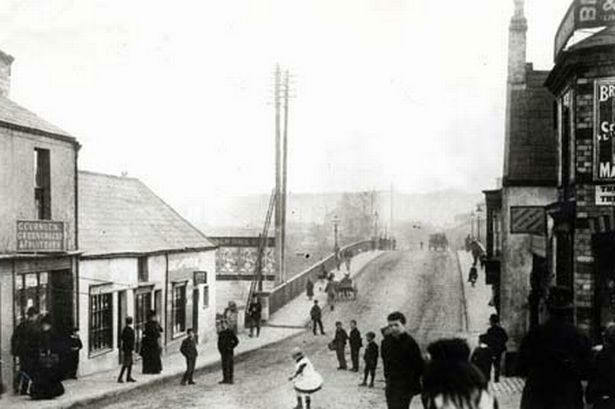 The old bridge was then demolished and the new one erected. On 22 June 1927 the new bridge was complete and opened to traffic by the Transport Minister Wilfrid Ashley. 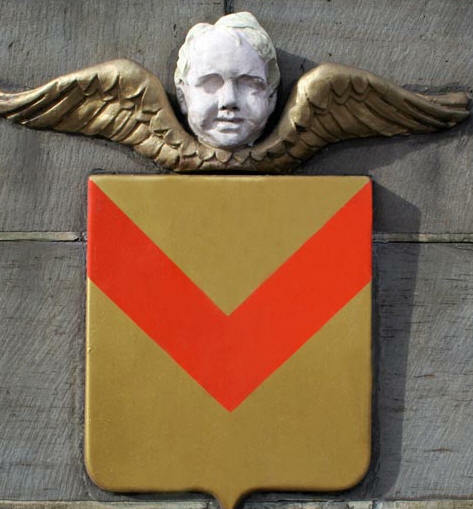 The new bridge has stone cherubs on four of the pillars that were modelled after Newport's coat of arms and mounted on the bridge. In 1994 John Squire, guitarist of The Stone Roses designed the cover of their hit single Love Spreads based on a photograph of a stone cherub on Newport Bridge. The song was the bands biggest selling single, reaching number 2 in the UK charts. The cherub design was found on many pieces of Second Coming merchandise, the album from which Love Spreads is taken. The site was a difficult one because of the very high tidal range and the need to maintain access for high-masted ships .Various alternatives were suggested including a conventional bridge, a lifting bridge and a tunnel. To achieve the necessary height the approaches to a conventional or even lifting bridge would have had to be extremely long and a tunnel was considered too expensive. The bridge was designed by French engineer Ferdinand Arnodin. It was built in 1906 and opened by Godfrey Charles Morgan, 1st Viscount Tredegar on 12 September 1906, The design was chosen because the river banks are very low at the desired crossing point (a few miles south of the city centre) where an ordinary bridge would need a very long approach ramp to attain sufficient height to allow ships to pass under, and a ferry could not be used during low tide at the site. The height of the towers is 242 feet (74 m) and the height of the horizontal beam above the road is 177 feet (54 m). The transporter platform or gondola travels the 645 feet (196.6 m) between the towers at ten feet (three metres) per second powered from the engine room. This Transporter Bridge is the largest of the eight which remain worldwide,and the oldest of its type in Britain. It is considered the largest transporter bridge in limited terms only. 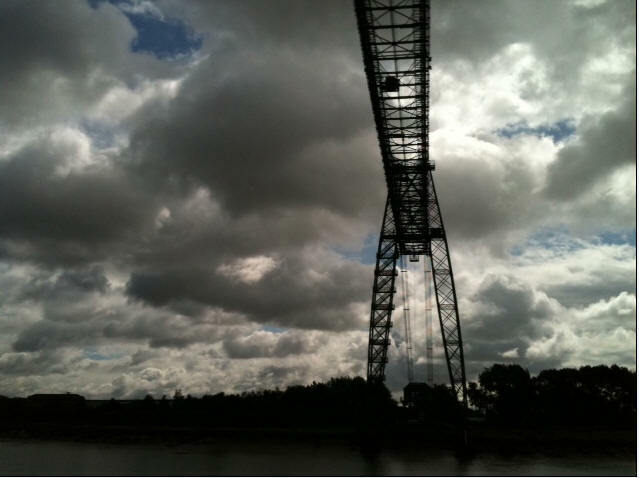 When compared with Middlesbrough's Transporter Bridge the Newport Transporter is: 16 feet (5 m) taller; but 200 feet (62 m) less in total deck span (discounting the anchor cables which, as with a ship, is technically part of the object but does not contribute to its overall length); and utilizes approx. 1400 tons of steel compared to 2600 tons for Middlesbrough's Transporter (this weight of steel takes no account of concrete foundations or concrete anchors}. 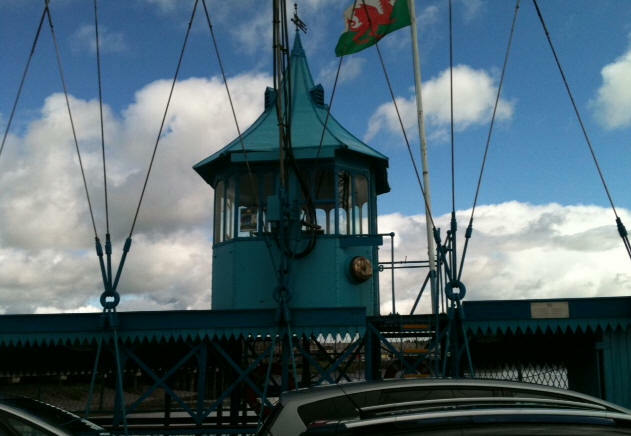 Today, the bridge is widely regarded as the most recognisable symbol of the city of Newport. The bridge was shut down in 1985 because of wear and tear. Following a £3 million refurbishment, it reopened in 1995. Service was suspended again in December 2008 with the bridge facing a £2 million repair bill. £1.225 million was spent on refurbishment, financed by grants from the Welsh Assembly, Newport Council and Cadw. It re-opened on 30 July 2010. The bridge was closed on 16 February 2011, because of operational problems, but re-opened again on 4 June. The bridge is a bow-string arch design, 650 ft (200 m) long and forms part of the city's Southern Distributor Road (SDR). On completion of the SDR, the A48 road was diverted over the new bridge, making it the preferred route for through traffic. Between the two top chord pillars the west-bound carriageway of the bridge bears a large emblem of the Arms of Newport City Council. In 2005 the bridge was recognised by The Structural Steel Design Awards. 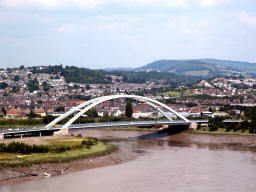 The judges said of the bridge: "The Usk crossing symbolises the best in British bridge engineering. It combines an elegant design, high quality fabrication and innovative construction. 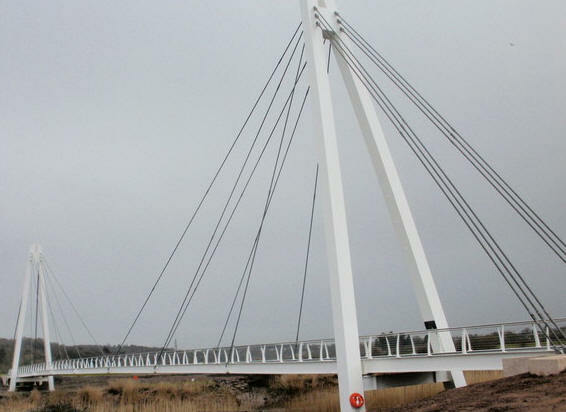 Newport has gained not only another much-needed river crossing, but has gained an elegant steel structure in the process." 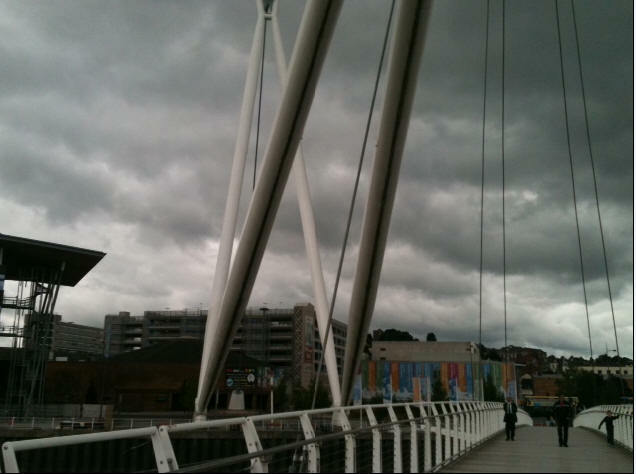 The bridge links the east bank of the river in the vicinity of Rodney Parade stadium to University Plaza on the west bank. It was the first major public project in Newport Unlimited's plans to regenerate the city. The bridge won a design award from the British Construction and Steelworkers Association; the George Gibby Award 2007 by the Institution of Civil Engineers in Wales; the regeneration award by The Royal Institution of Chartered Surveyors in Wales as well as a highly commended by Wales Business Insider for the best regeneration project of 2007. The bridge features two A-Frame masts, which support the bridge from the west bank. The masts are positioned on a shared foundation and anchored at ground level by two 4 3⁄4-inch (120 mm) diameter cables that are connected the tips of the masts. The forward mast is 262 feet (80 m) long and the back mast is 226 feet (69 m) long. Because of the angle at which the masts are positioned, the bridge stands at 229 ft (70 m) above ground. The deck is 16 ft (4.9 m) wide and 13 1⁄2 ft (4.1 m) above water at high tide. The bridge has a clear span of 476 feet (145 m). The St. Julian's railway bridge carries the Welsh Marches Line across the river in a north—south direction. Due to the meanderings of the river, all the other crossings are east—west. The line was originally opened in 1874 by the Pontypool, Caerleon and Newport Railway. Close to the bridge there is a stone half buried in the ground with the year 1866 etched in it. 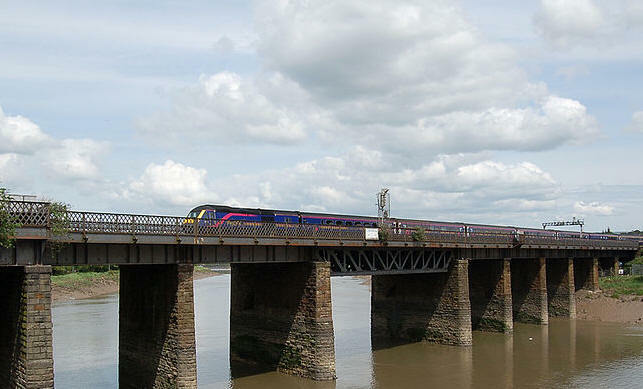 The Great Western Railway Usk bridge is a crossing of the River Usk in Newport city centre. It carries the Great Western Main Line across the river in an east—west direction.The original wooden structure was constructed by the South Wales Railway in 1848, but just as the final arch was being put into place on 31 May, a heated bolt ignited chemicals used to preserve the wood and a catastophic fire destroyed most of the structure. To prevent a recurrence of the fire, the renowned railway engineer Isambard Kingdom Brunel invented the now-common bow-string-shaped girders to replace the wood sections. In 1888 the bridge was replaced with one made of stone, and by 1911 it had been widened to four lines. 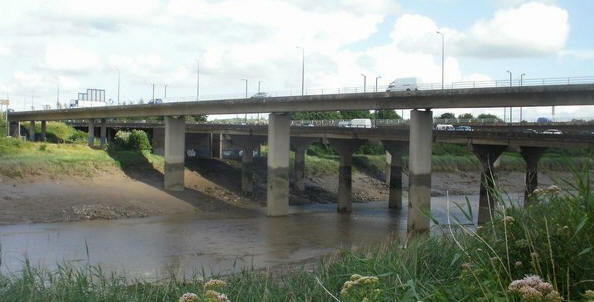 The M4 motorway Usk bridge (or St. Julians Bridge) carries the M4 motorway across the River Usk. The bridge is actually two separate 450-foot (140 m) bridges for the eastbound and westbound carriageways. When travelling westbound, the bridges lead directly into the twin 1,200-foot-long (370 m) Brynglas Tunnels. Work commenced on both the bridge and the tunnels on 10 September 1962, two months after work commenced on the George Street Bridge further downstream. The entire Newport bypass section of the M4 (junctions 24 to 28) finally opened in 1967. In 1989 a further two crossings (east/westbound) were added as a connection from the M4 (at the newly constructed junction 25a) to the north/southbound A4042 Heidenheim Drive. The new bridge, The Twenty Ten Bridge, links the practice ground to the golf course across the River Usk and was officially opened by the First Minister of Wales, Carwyn Jones AM. Rowecord Engineering of Newport, provided all the steelwork and structure and Andrew Scott Ltd was the main construction contractor. Caerleon Bridge is a bridge crossing of the River Usk at Caerleon.The stone built bridge was opened in 1806 as a replacement for the previous wooden bridge, it carries the B4236 road from Newport into Caerleon itself. Prior to the opening of the A449 dual carriageway a few miles to the east in 1972, the narrow bridge and streets of Caerleon carried the trunk road from Newport to Raglan via Caerleon Bridge. 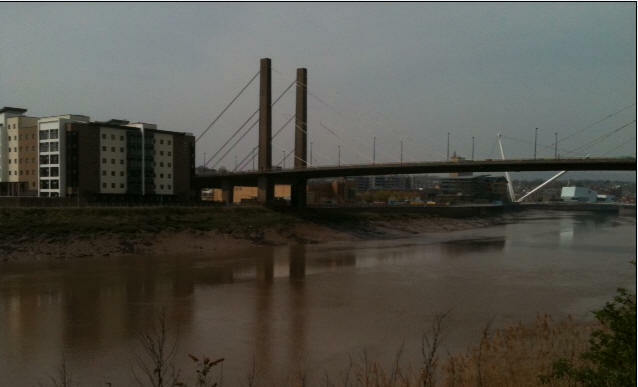 The bridge is the furthest upstream of the ten bridges over the River Usk within the city boundaries of Newport. The foundation stone of the original Newport Bridge is set into the stonework of Caerleon Bridge bearing the inscription "This bridge was erected at the expense of the County by David Edwards and his two sons William and Thomas. Completed AD MDCCC."